I spend most of my waking hours thinking about food. But you already know that! However, you may not know that many of those food hours are spent thinking about beautiful, long, lazy weekend brunches. They are just the best. Where restaurants used to focus on their lunch and dinner menus, there is now a real spotlight on weekend brunching in London. We are now spoilt for choice so it can be hard to find the real gems. 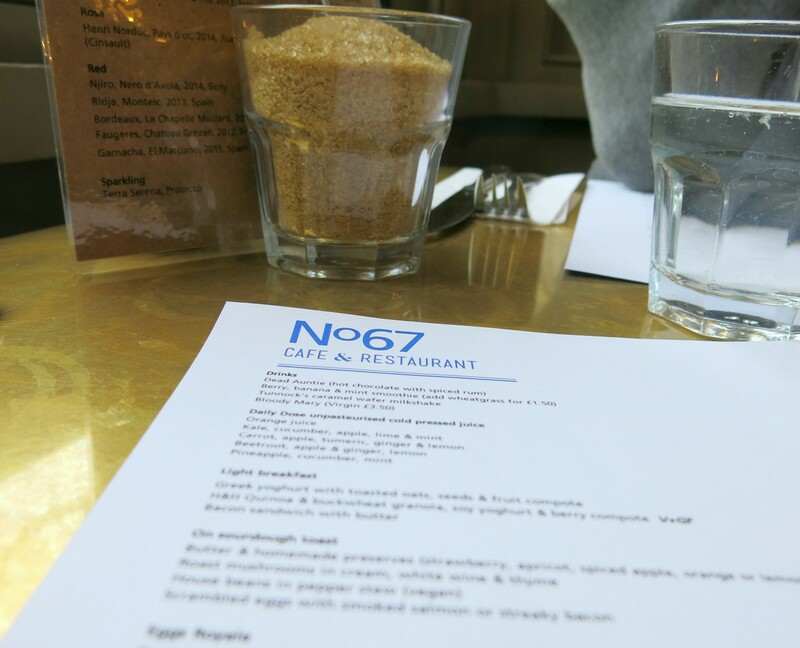 Let me introduce you to No67 Cafe & Restaurant. Its part of the South London Gallery situated on the Camberwell/Peckham boarder and it’s a lovely bright and airy space. We went on a very cold and rainy day so didn’t fancy exploring much, but it looks like a cool little space with a nice chilled vibe. The weekend brunch menu at No67 is nice and concise. Just how I like it. It’s quite a simple menu with the focus being on fresh ingredients. As you know, I’m a sharer. So I was very happy when my brunch partner Becky was happy to go halves on a savoury and sweet dish! 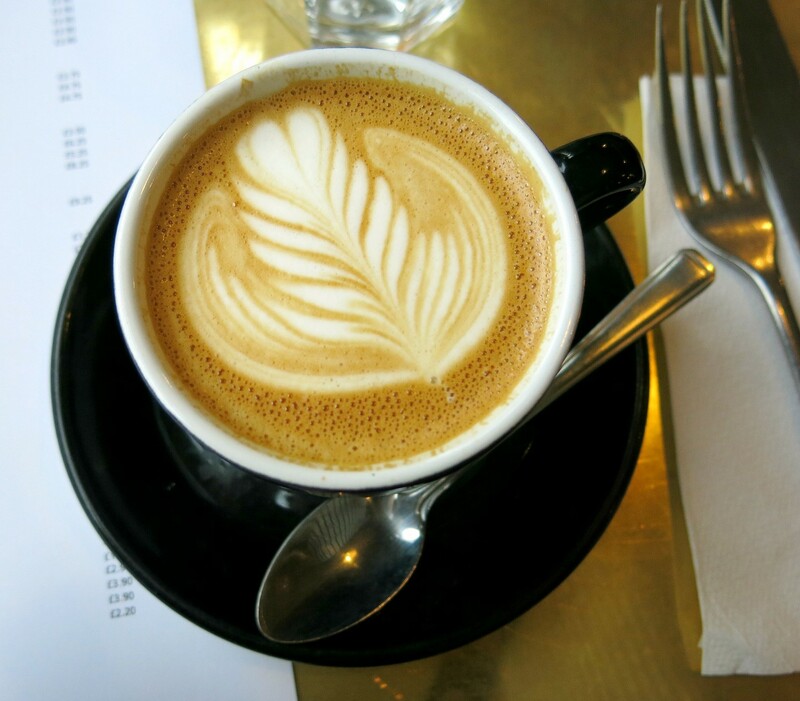 Whilst we enjoyed the very good flat whites, we read through the menu. The menu included lighter dishes such as H&H Quinoa & buckwheat granola, soy yoghurt & berry compote and some great veggie options too like the House beans in pepper stew. 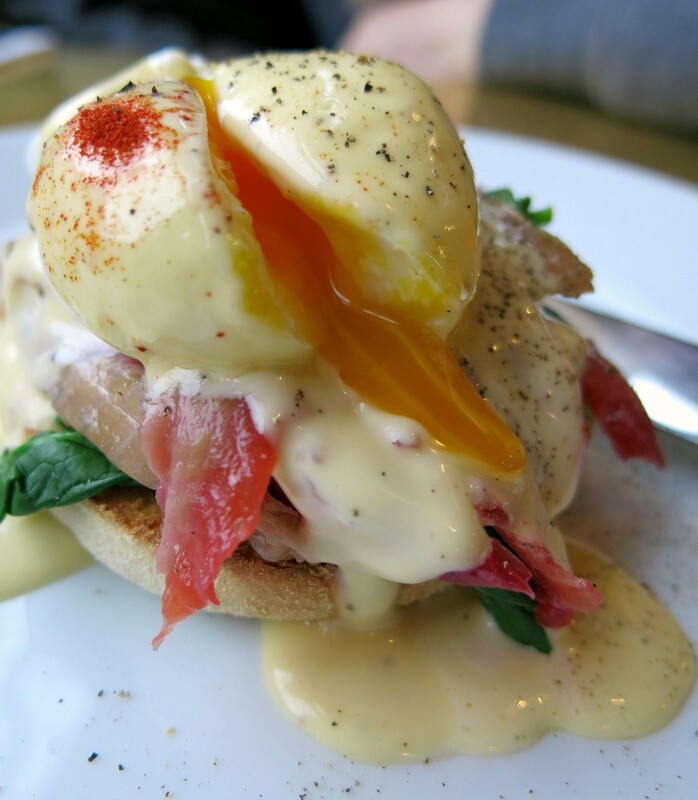 But having already looked at the menu before we arrived we had our eye on the beetroot cured trout, spinach, poached eggs & hollandaise sauce on an English muffin. This is not a dry muffin, double egg sorta place. No. 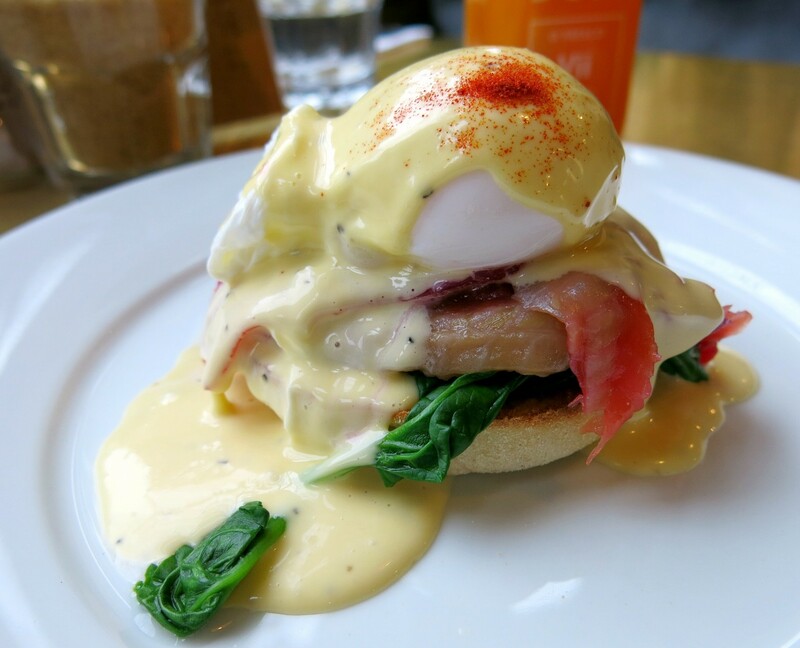 You get one fully loaded fluffy muffin with thick slices of trout, a beautiful runny poached egg and the perfect hollandaise. Every mouthful was a joy. I will 100% be ordering this again next time I visit. We decided to keep it an alcohol free brunch and so we picked from the great pressed juice menu. The carrot, apple, turmeric, ginger & lemon was nice and spicy and definitely put a spring in my step! 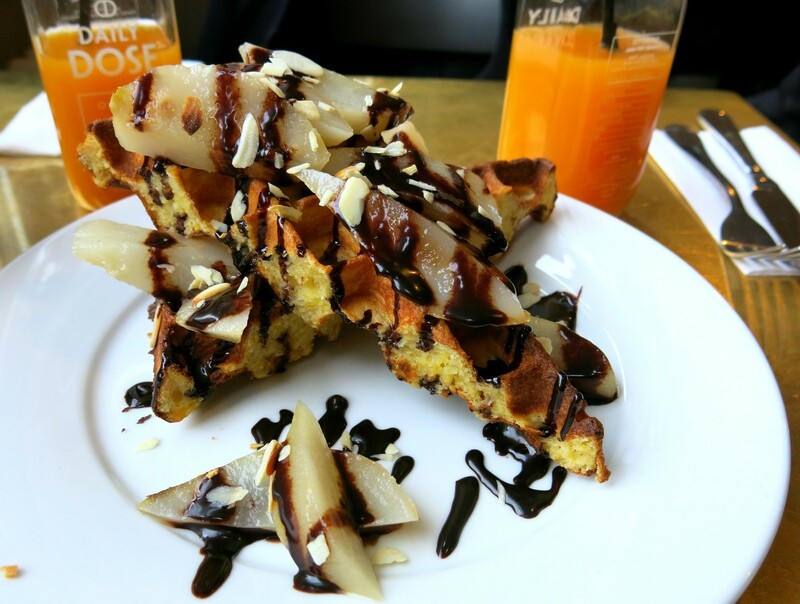 When the waffles arrived topped with poached pear, almonds, crème fraiche and chocolate sauce I actually thought they looked like they could do with extra sauce. But I was so wrong. These were the best waffles I’ve had in ages! They were so light and fluffy and very slightly crisp on the outside. I liked the freshness of the pears and crème fraiche. A lovely way to end our brunch. 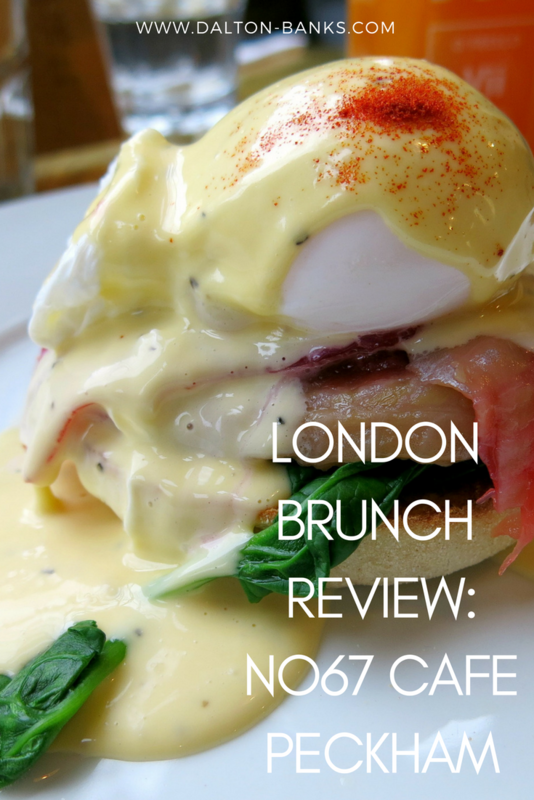 No67 Cafe & Restaurant is a great spot for brunch in Peckham. It’s a beautiful building too and I can’t wait to enjoy brunch alfresco in the summer months. And get here early! We arrived at 10am when it opened and it was full by 11am. It’s that good. I enjoyed every mouthful I ate which is saying something! The food here is cooked extremely well. 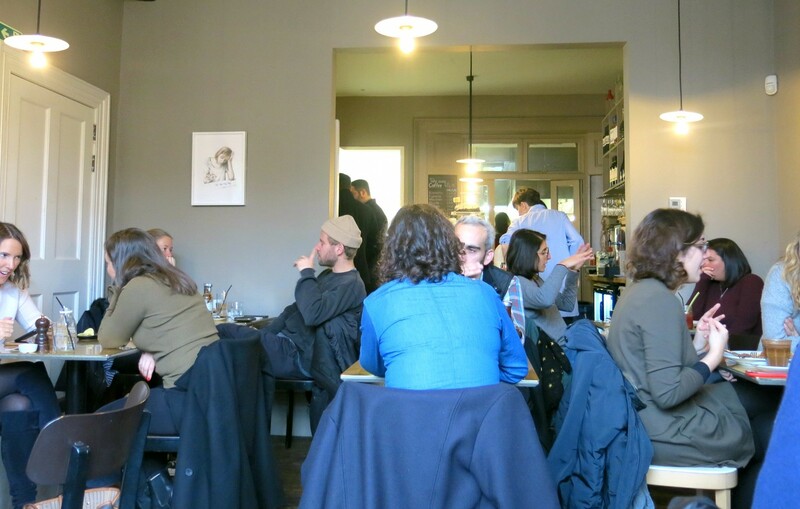 It’s not trying to be different (which I find a lot of restaurants doing now to the cost of good food), it serves delicious food in nice relaxing environment. Which is exactly what I want when I have a nice leisurely brunch at the weekend. Oh wow! That egg dish looks (and sounds) fantastic. It really was! It was nice to have trout for a change and they’ve got the hollandaise spot on. I do love a simple menu – makes things so much easier, and it looks like they’ve mastered theirs! Exactly. I always get weary over a long menu as how can it all be fresh!? They definitely have – the eggs were perfect! I love the sound of the beetroot cured trout but the waffles really steal the show! Will definitely check this place out if I’m in the area, I’m a brunch fanatic! Oh you should if you love brunch – they do it very well!